Signed Copies for Christmas – Bounce Sales & Marketing Ltd.
Offer your Christmas shoppers something a little unique. 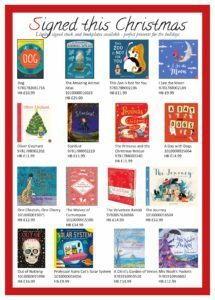 Bounce are offering limited signed stock of a number of our titles from Pushkin, Flying Eye, Nosy Crow, Gecko Press, Otter-Barry Books and No Brow. Download the order form and order now while stock lasts and get something that little bit special for your customers.